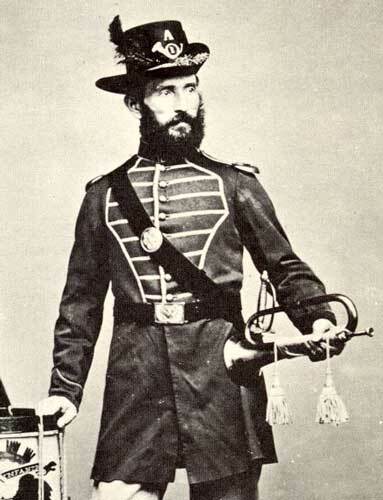 This 1866 official quartermaster department photograph shows the uniform of an infantry musician. He is wearing the characteristic braid pattern on the front of the uniform frock coat. The sack (fatique) coat when worn by musicians did not have any distinctions. He is wearing a noncommissioned officer's sword rather than the regulation musician's sword. Elements of the Uniform:Hat Eagle, Hat Letter, Hat Number, Hat Branch Insignia, Shoulder Scales, Cross Belt Plate, Enlisted Buttons, Sword Belt Buckle,and N.C.O. Sword.